The long awaited Veere Di Wedding trailer is out. And it is winning the Internet and the world outside it, with its #notachickflick stance, that nevertheless has 4 girls in the middle of a wedding drama. So what did I think of it? Spoiler Alert: Not Much. And here’s why. I would like to tell the film makers behind this highly stylized piece of work that you cannot portray a modern woman by filling her mouth with profanity and handing her a cigarette – at least that is not the only way! We have heard this a million times – women can drink, drive, smoke and curse (not in that order, hopefully), I get it! And, I have said this before: I have feminist friends who do not smoke. Are you trying to tell them that they cannot believe in themselves unless they smoke? That, I will not take. The Veere di Wedding trailer is disturbing on several counts. While I understand that the movie is meant to be a comedy, I cannot fathom how Kareena Kapoor can look so convincingly crest fallen about not being able to figure out what to call whom once she gets married and meets the husband’s family. Really? Is that seriously the biggest problem you have in life? Ever heard of world poverty? Doesn’t look like, with all those opulent sets, five star hotel rooms and exotic locales we can see in the trailer. Which brings me to the next point. Why does everyone have to be rich here? Lack of research and perspective when it comes to finding new characters? While I do not blame them for being rich, I am wondering what will happen when this kind of a film gets made with real characters who are struggling with real life issues along with cold feet; and without nepotism? The next bone of contention that I am going to pick is the actual setting of the story – the wedding. Again – really? How come a wedding is always the backdrop for all the angst of a female character? Why is she not soul searching while she is single or while she is dating? Or how about a career, or a back packing trip for a change? Why does a wedding with all its drama and event planning, have to serve as the backdrop for all dramatic stories in the India film industry – from Zindagi Na Melegi Dobara (which was still better because it did not have a single glitter infused set), to Sonu ke Tittu ki Sweety (not going into how clueless this one seemed). 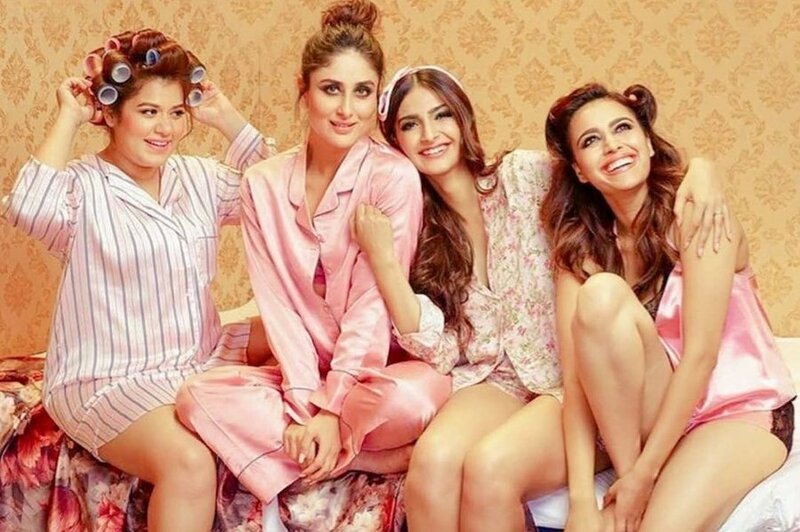 While I am not doubting the prowess of the all the 4 actors Veere Di Wedding who must have essayed their roles with well practiced theatrical fluency, I would like to watch how all this translates on screen with a movie that has a jarring amount of pop culture covering up the actual plot line. But much more interestingly, I would like to hear what the Censor Board will have to say and the resulting pow wow between them and the actors. Just saying.